Over the years, we’ve all heard of uncontacted tribes in various parts of the world, but the Sentinelese people probably take the crown. Inhabiting an isolated, unexplored island beyond India’s eastern coast, the Sentinelese violently reject all contact, maintain a completely primitive lifestyle, and by all accounts they haven’t even learned how to make fire. The Sentinelese don’t like it when boats come to close. Image credits: Christian Caron // Creative Commons. In 2006, two fishermen in the Bay of Bengal had a bit too much to drink. They anchored their small boat to a rock and then went to sleep. Unfortunately for them, the anchor came loose and the boat started to drift, ending up on a remote island — an island inhabited by tribal people who greeted them with a hail of arrows and javelins. These tribal individuals fiercely reject all external human contact, so without much thought, they killed the two fishermen, burying them in two shallow graves. When the coast guard tried to retrieve the two bodies by helicopter, they were also met with the similar treatment, but thankfully, they were high up enough to escape unscathed. Unbeknownst to the two unfortunate fishermen, they had drifted into what is probably the last pre-Neolithic culture on Earth: the Sentinelese. The Neolithic began around 10,000 years ago — so these people live as our ancestors did 10,000 years ago. They maintain a hunter-gatherer society, subsisting through hunting, fishing, picking wild plants and collecting coconuts, which arrive as flotsam. For hunting, they use flatbows and javelins. For fishing, they use bow-like harpoons. Interestingly, they have been known to use untipped arrows as warning shots. They seem to also fish using nets, with which they also collect shellfish from their lagoon. They build rudimentary canoes, but only for coastal excursions — never sailing into the open sea. Sometimes, the Sentinelese also collect wild honey, using a rake-type tool to pull it down. They live in shelter-type huts with no side walls. Sometimes, they fashion a floor from palm leaves. They also seem to have larger, communal buildings, whose purpose is not exactly understood. The Sentinelese wear no clothes — only leaves, fiber strings, or decorations. Headbands from vines appear to be fashionable among men. Studies have found no evidence that the Sentinelese are aware of agricultural practices, or are even capable of producing fire. The only times they use fire is when it is produced spontaneously. When this happens, they use these embers inside dwellings, but they don’t seem to be able to produce it on their own. They truly are the most isolated tribe in the world. Let’s take a step back and consider just how amazing this is: this is the 21st century, in the Bay of Bengal. Just 50 km east, there lies the modern city of Port Blair, and these people don’t know how to make fire. How did it get to this? 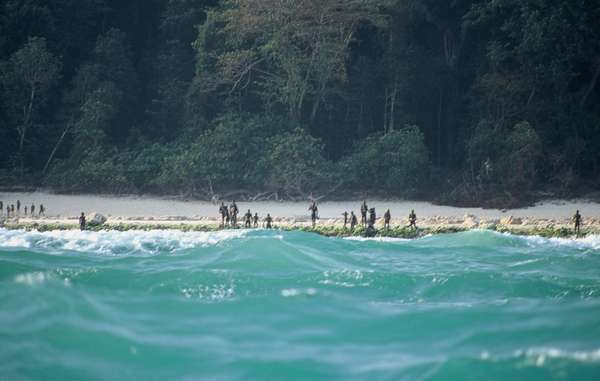 North Sentinel Island. Image credits: NASA Earth Observatory image created by Jesse Allen. The Sentinelese inhabit an unexplored island called North Sentinel island, located in the Andaman Islands. 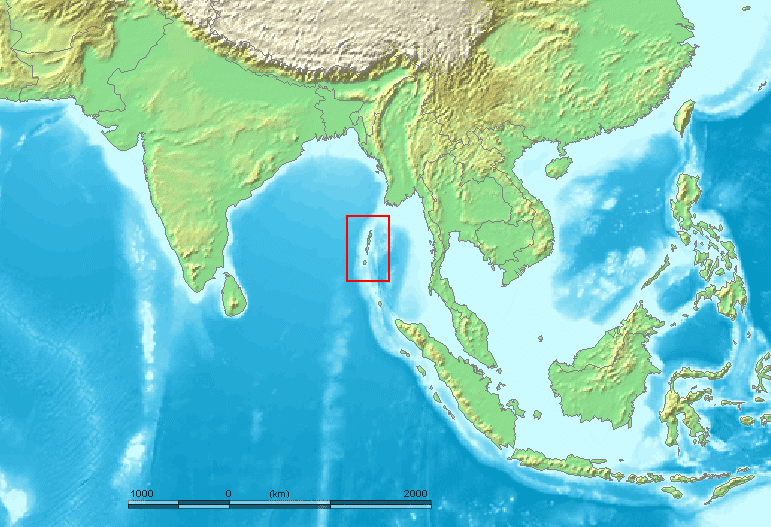 The Andaman Islands form an archipelago in the Bay of Bengal between India, to the west, and Myanmar, to the north and east. The earliest history of the Andaman Islands is not known, but we do know that the islands have been inhabited for several thousands of years. The oldest archaeological evidence dates back some 2,200 years, though the islands have been almost certainly inhabited for thousands of years. The Andaman people are actually regarded as a key stepping stone in the so-called “Great Coastal Migration” — a period of migration, some 60,000 years ago, when early human populations migrated from Africa along the southern coast of Asia, from the Arabian peninsula via Persia and India to Southeast Asia and Oceania. The Sentinelese are classified as Negritos, a loosely connected group of peoples inhabiting isolated regions in South East Asia. The Negrito peoples show strong physical similarities with the pygmy peoples of Africa (such as very dark skin tone and peppercorn hair) but are genetically closer to their surrounding populations in Austronesia. The Sentinelese also appear to be markedly taller than other Andamanese peoples. More recently, between 800-1200, the Tamil Chola dynasty created an empire that eventually engulfed the Andaman Islands. Not much is known about the islands before or after that — until 12 December 1755, when ships from the Danish East India Company arrived in the nearby Nicobar Islands, where they established a small colony. By now, several distinct populations were inhabiting the islands. In 1789 the British arrived even closer — they set up a naval base and penal colony on Chatham Island next to Great Andaman, which is now the town of Port Blair (just 50 km from the Sentinelese). This colony was abandoned due to disease but was permanently re-established in 1852. Still, not much was known about the natives, and neither the Danish or the British had much interest in studying them. That changed during the First Burmese War, fought between the British and the Burmese Kingdoms. Some British crews were unfortunate enough to shipwreck in the Andaman islands where they were brutally attacked. They then learned that some of these people were cannibals, and the Andamans maintained a reputation for cannibalism ever since. It’s important to note, however, that the Sentinelese don’t appear to be cannibals — the two fishermen they killed were buried in shallow graves, not eaten. 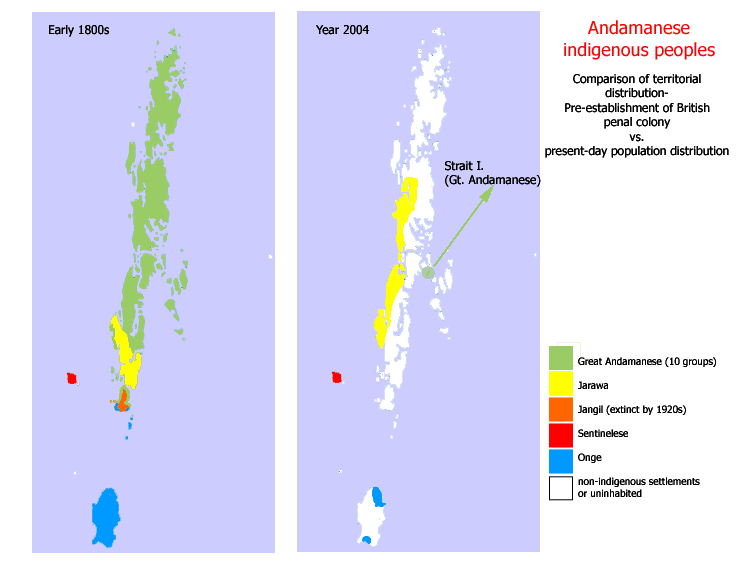 Map showing comparative distributions of Andamanese indigenous peoples, pre-18th century vs present-day. Map created by CJLL Wright; after data from Man and Weber. Still, the North Sentinel Island completely avoided external contact — until 1867, when the ship Nineveh wrecked on the reef surrounding the island. The ship’s crew of 86 reached the beach in boats. After three days, they were attacked by the Sentinelese with iron-tipped spears. They managed to escape and were rescued not long after. In 1880, however, an official survey visited the island. The British policy at the time was to visit all islands inhabited by unfriendly tribals, take a prisoner, and shower him with gifts in the hope that this would gain the peoples’ trust. So heading an armed expedition, 20-year-old Maurice Vidal Portman reached North Sentinel Island. Threatened by the armed soldiers, the Sentinelese appeared to run into the jungle whenever spotted. Finally, after several days, Portman managed to find an elderly couple and their four children — he kidnapped all of them. Shortly after that, the elderly couple became ill and died, probably from contracting diseases to which they did not have immunity. The four children were given gifts and then released back to the island. Without a single gesture, the children ran into the jungle and never looked back. Likely spooked by this failure, the British completely ignored the island and focused on other tribes. 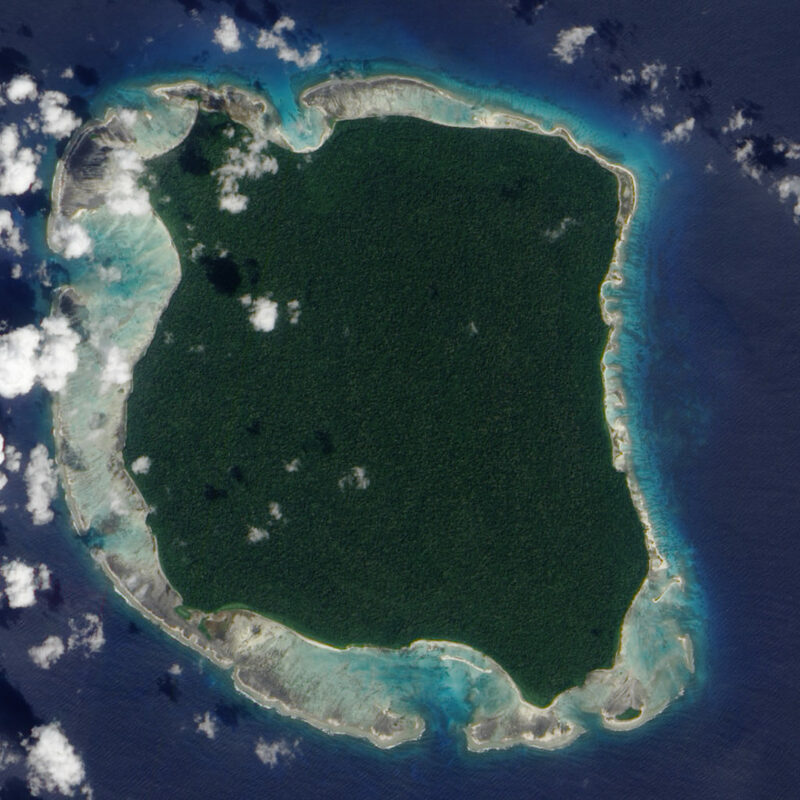 Again, North Sentinel Island was completely isolated — for about a hundred years. In 1967, the Indian government began a series of “Contact Expeditions” to the island, under anthropological guidance. They wanted to establish contact with the tribes in the archipelago. Spoiler alert: it didn’t turn out so well. The first expedition witnessed the Sentinelese retreat into the jungle. The anthropologists tried to send gifts via the water, but were unsuccessful in establishing any form of contact with the Sentinelese. Then, in 1974, a National Geographic expedition shooting a documentary was even less successful. Attempts have been made to bring in Onge-speaking individuals — one of the most common languages in the area. However, exchanges were short and brutal, and the Onge-speaking individuals couldn’t understand a word of what the Sentinelese were saying. In fact, their language appears to not have any similarities to any language, from the archipelago or beyond it. More recently (the 1990s), the Sentinelese seem to have mellowed out a bit, allowing boats to come closer to the shore, and even greeting visitors unarmed –ma but only for a few minutes. After this brief peaceful greeting, they return to menacing gestures and warning shots. Given how the Sentinelese strongly oppose any form of contact, the current policy of the Indian government is simply to avoid these islands. Aside from their violent behavior, the Sentinelese also have a completely unadapted immune system, so exposing them to the outside world could be devastating. In theory, North Sentinel Island is under Indian control, but in practice, the Sentinelese exercise complete sovereignty over their affairs and the involvement of the Indian authorities is restricted to occasional monitoring. When the two fishermen were killed, no one was prosecuted, and there are no plans to do so. Visits are ever more brief and infrequent, and despite many groups and organizations discussing plans for making contact with them, nothing has materialized. Acces to the island is forbidden. We don’t even know how many Sentinelese there are — estimates range wildly from 15 to 500. The one thing we do know is that they can throw javelins and arrows from quite a distance. Indian authorities were worried that the devastating 2004 tsunami could have wiped them completely. A helicopter was sent to the island to bring food to survivors, and it found that as far as the eye can tell, the Sentinelese were doing fine. A bowman greeted the helicopter with the familiar warning shots. What drove these people to the extreme isolation they seem so willing to fight for? What made them so unique that 10,000 years of progress went past them untouched? Could we learn something from them — perhaps, something about the human nature? The Sentinelese raise many questions, but answers are few and far between. We can see them from drones, we can see them from helicopters, and sometimes, we can even see them from their very island. But at least for now, communication is out of the question — and it’s probably best if things continue to stay that way. The Sentinelese are no doubt vulnerable to the numerous diseases modern society has grown accustomed too, and there’s a good chance a potential meeting will end up being a disaster.